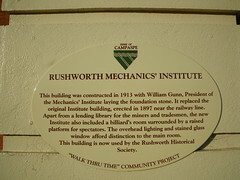 Rushworth Mechanics' Institute. Founded 1861. This building erected 1913. The Mechanics' Institute movement began in British urban industrial centres in the early 1800s. A "mechanic" was a person applying skills and technology. During the 19th century, most towns in Victoria established a Mechanics' Institute or Athenaeum with a library and meeting hall. Common objects were the "spread of useful knowledge" and provision for "rational recreation" in the community. 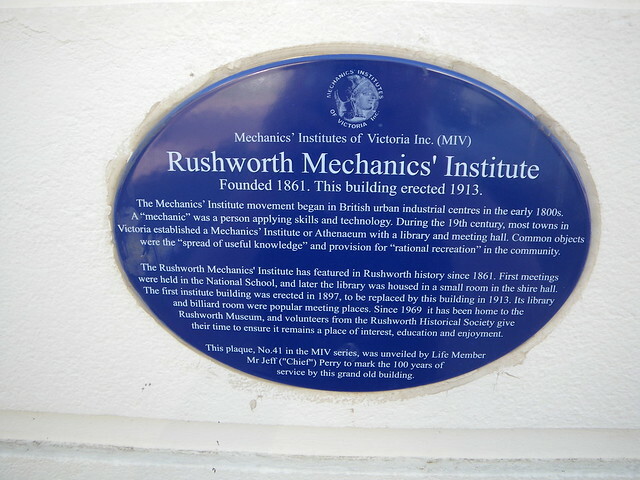 The Rushworth Mechanics' Institute has featured in Rushworth history since 1861. First meetings were held in the National School, and later the library was housed in a small room in the shire hall. The first Institute building was erected in 1897, to be replaced by this building in 1913. Its library and billiard room were popular meeting places. Since 1969 it has been home to the Rushworth Museum, and volunteers from the Rushworth Historical Society give their time to ensure it remains a place of interest, education and enjoyment. This plaque, No. 41 in the MIV series, was unveiled by Life Member Mr Jeff ("Chief") Perry to mark the 100 years of service by this grand old building.